Simone Hylton-Chambers joined the JN family in 2001 as Business Analyst in the then Corporate Planning and Special Projects department. In 2011, she was promoted to Senior Manager, and in May 2016, was appointed Executive, Corporate & Strategic Planning, JN Group. 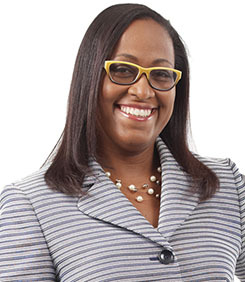 With the restructuring of the Society and the launch of The Jamaica National Group and JN Bank on February 1, 2017, Mrs Chambers was appointed Executive, Corporate & Strategic Planning for The Jamaica National Group. With over 16 years experience in Corporate and Strategic Planning and almost two decades in the financial services industry, Mrs. Hylton-Chambers has a wealth of experience in Strategic Planning & Execution, Finance, Research & Analysis as well as Credit Management. She is responsible for managing the strategic planning and management process for The Jamaica National Group and its subsidiaries, and over the years has been integral in the development and attainment of significant organisational goals.